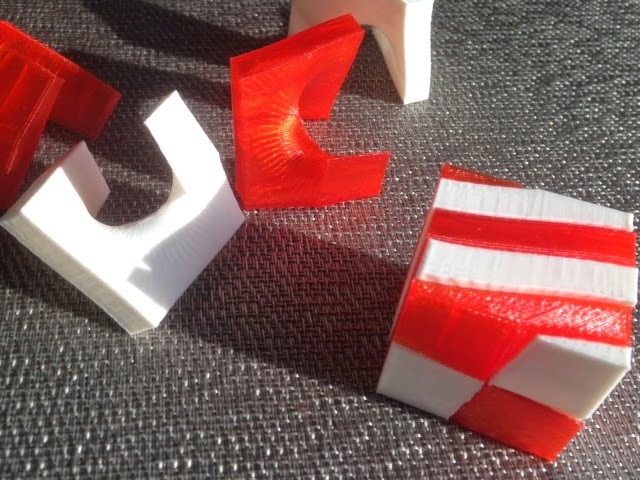 Today we printed the four-piece cube puzzle from GeorgeHart's Five Screw-Puzzles model on Thingiverse. This one is very easy in comparison to the tricky tetrahedron puzzle from that set of models, which we printed on Day 104, but it is a good warmup to the trickier puzzle since it works basically the same way. And just as importantly, it makes a really beautiful two-color model. Settings: We used a MakerBot Replicator 2 on .2mm/standard with a raft but no supports, on blue tape over a glass build plate. The model printed very nicely without supports and required only minimal cleanup and edge-smoothing with a knife. We printed two of them in different colors in order to make 2-color models. It looks particularly good with one translucent and one opaque filament color. Stuff to change: The resulting model is very loose so next time I would try printing on .3mm/low to see if things tighten up a bit. Also the very tips of the square ends of the pieces got sliced very thin and came off during cleanup. Nobody looking at the model would notice this unless you pointed it out to them, but it contributes to the overall looseness. The thin area could be fixed by extending the square ends of the pieces just a little bit further.